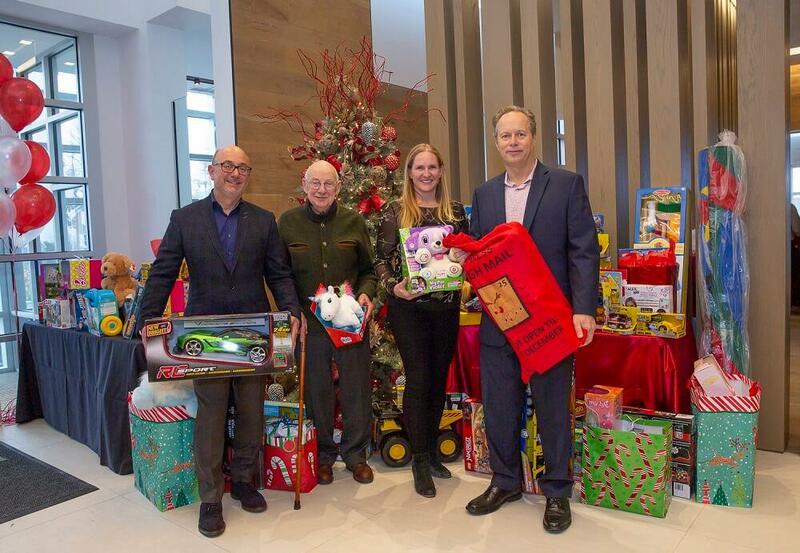 Kylemore Communities/Angus Glen Development embraced the spirit of giving this season with a donation to benefit Markham Stouffville Hospital Foundation and by hosting an annual Holiday Celebration for consultants, suppliers and staff. An important part of the company’s annual Holiday Celebration is a Toy Drive and the total donations made an impressive display, once again. The donated toys and games were divided between local organization Hampers of Hope, as well as SickKids Hospital, Toronto. The event was hosted by Cailey Stollery, CEO, Lindsay Stollery Jephcott, CIO of Angus Glen and Kylemore Group of Companies, and Kylemore’s Vice President Frank Spaziani. Join Kylemore in supporting the Bear Necessities program, which uses donations to purchase life-saving equipment that government funding doesn’t cover. To support the Bear Necessities program, you can purchase a Teddy Bear, a soft sleep sack for newborns, or a warm blanket for a patient. For more information, visit lifesavinggifts.ca or call 905-472-7059. Kylemore has made the Angus Glen neighbourhood in Markham one of the most highly sought-after places to live not only in the GTA but in all of Ontario. The world-class golf course is a prestigious backdrop to the high-quality, luxury homes built by Kylemore. As Cailey Stollery pointed out, Kylemore has been building and developing Angus Glen for decades. We happen to have a few details on what Kylemore has planned in the area for 2019 and 2020, but we’re keeping it close to our chest for now. We don’t have the greenlight to share the details yet, but we can say that Kylemore has some big, exciting plans for the area! We love seeing builders giving back to the communities in which they build, so hats off to Kylemore, their suppliers, trades, and consultants, and all the residents and businesses of Angus Glen for making 2018 a huge success. We can’t wait to learn more about Kylemore’s plans for next year.